Melt butter in a large skillet over medium heat. Add onion and saute until softened about 7-10 minutes. Add garlic and saute one more minute. Add tomatoes, vodka and red pepper flakes and cook for 15 minutes. Using a hand blender, puree sauce. Stir in cream and cook for 5-10 minutes or until thicken to consistency of your liking. Season with salt and pepper. 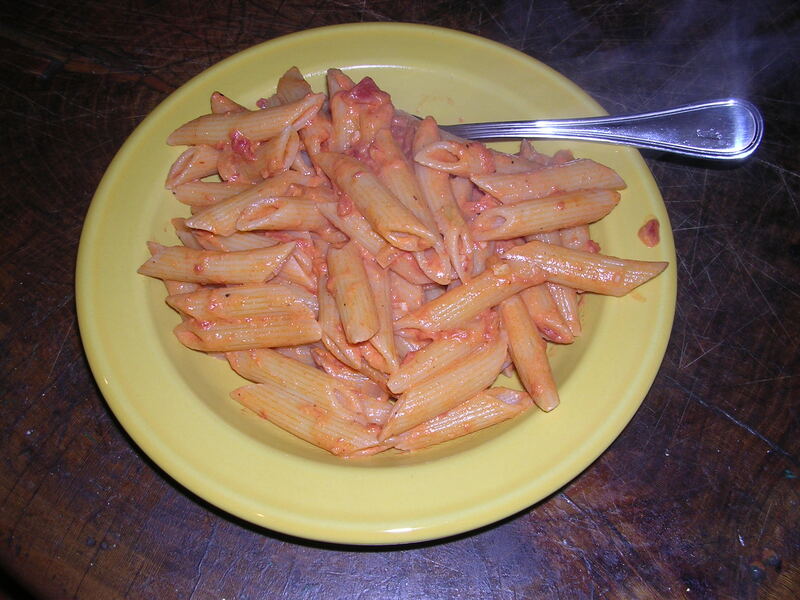 While sauce is cooking, add penne to a saucepan of boiling salted water and cook for 10-13 minutes or until al dente. Drain and combine pasta with sauce in the skillet and toss until sauce is evenly distributed on pasta. Serve in pasta bowls with a sprinkling of the chopped basil. Note: We like either the organic Muir Glen tomatoes or San Marzano ones. You can add cooked chicken or salmon, torn into pieces, to the pasta if you want. If you forget to drain the tomatoes (like I sometimes do), rapidly simmer the sauce an additional 15-20 minutes before adding the cream!